Learn how to make your own sushi wrapper with our easy steps for rolling sushi and technique for making hand rolls. 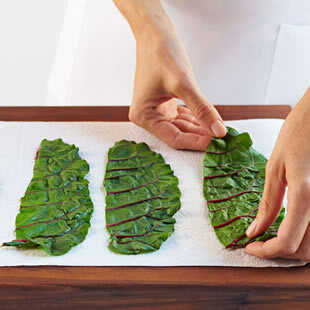 In this variation on traditional sushi, use Swiss chard as a wrapper, the same way you’d use nori. Cut out the center rib from each chard leaf, leaving two long pieces of chard. Drop leaves into a pot of boiling water just until they soften, 20 to 30 seconds. Transfer to a bowl of ice water; drain. Spread on a towel and pat dry. 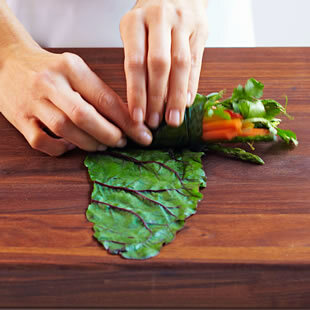 Place one piece of chard leaf on a clean cutting board. Place a stack of ingredients on the bottom 2 to 3 inches of the leaf, allowing the longer ingredients to overhang one side of the leaf. 3. 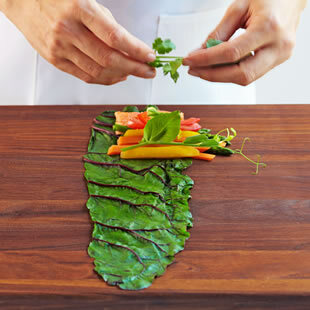 Roll and tuck the chard leaf around the ingredients so it’s rolled closed on one side and left open on the opposite side, similar to the shape of an ice cream cone. Trim the bottom of the roll, if necessary, for a flat base. Each roll is an individual serving.